The market for virtual reality headsets—like the popular gaming system known as Oculus Rift, or the many headsets that are now shipping with consumer drones—is poised for rapid growth starting this holiday season. In fact, Juniper Research estimates that global sales of VR headsets will hit 3 million next year and as much as 30 million by 2020. That rapid market growth owes its success to advances in commercial VR technology and prices that put even the most advanced capabilities within reach of average consumers. And now the Army is betting on being able to leverage the same low-cost consumer technology to help augment its training programs for soldiers. Army officials from the Combined Arms Center-Training Innovation Facility at Fort Leavenworth, Kan., plan to showcase a new virtual reality training system at the Interservice/Industry Training, Simulation and Education Conference, which runs Nov. 30 to Dec. 4 in Orlando. Known as the Stryker Virtual Collective Trainer concept, the system will help soldiers train on the Army’s new Stryker combat vehicle for a fraction of the cost of the major simulators used to train on the M1 Abrams tank and other major fighting vehicles. 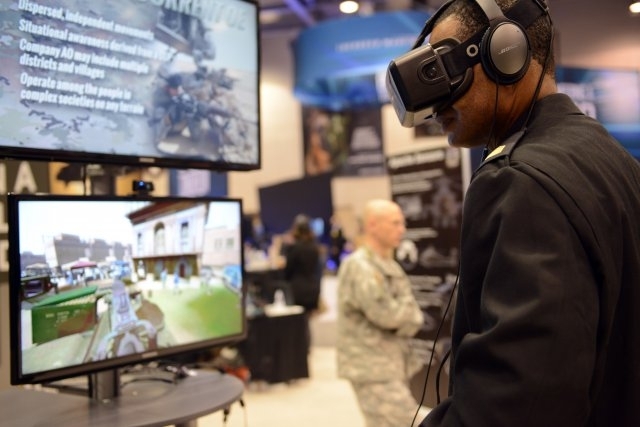 CAC-TIF developers used commercially available virtual reality headsets to create a 360-degree immersive environment for soldiers to train in, according to an Army blog post. And rather than spend millions of dollars creating a custom metal replica of the Stryker vehicle, developers created one out of plywood that does the same job. The CAC-TIF is part of the U.S. Army Training and Doctrine Command, or TRADOC, Capability Manager-Virtual and Gaming, which writes requirements for training simulators and approves simulators for the field. Getting early feedback from soldiers in the field will help the Army get training products to soldiers quicker and at lower costs, Stinchfield said. “Virtual reality provides immersion and a sense of presence that is as good, if not better than, the current simulators, at a fraction of the cost. The technology needs improvements, but several major companies will release retail versions in 2016 that we anticipate will be fully capable for the Stryker trainer,” he said. The CAT-TIF is part of a larger Army effort to develop the next evolution in training simulation known as the Synthetic Training Environment (STE). It will link live training to one overarching simulation. The Army believes the STE will provide an unprecedented capability for collective and multi-echelon training. The Army is also evaluating VR for artillery call-for-fire training and close air support. The goal is to develop a training system that would enable trainees to look over their shoulders at inbound aircraft in a 360-degree virtual environment. In addition to training applications, the Army is also looking at potential real-world uses for the technology, such as enabling commanders on the ground to conduct virtual reconnaissance of targets and objectives before actually carrying out their missions.